Fasting is the process of not eating for set periods of time. Our genetics are actually well suited for this process. We are the only species of human to survive the Paleolithic Era, and during this era, we had to experience periods of time where food was abundant, and other times when it was scarce. Flash forward to our modern society, and we typically eat 3-4 times a day, often snacking in between meals. Now, I’m sure if our Paleo ancestors had the ability to eat all of the time, they would (humans are also programmed to love food). But the fact that our species survived one of the harshest eras of existence (the Paleolithic Era and corresponding Ice Age) means something; our metabolism is programmed to run optimally when food and energy intake is random and varied, not constant (for the technical bent, these are called stochastic processes). As research is starting to show, a constant intake of energy may not be so beneficial for us in the long run, especially if we are living mostly sedentary lives. During fasting, when our intake of macronutrients glucose, fat, and protein, are zero, our body begins to burn glycogen stores in the liver (our body’s way of storing glucose for periods of no food) to release glucose for the body and the brain. However, once our glycogen stores become depleted, our body switches its metabolism towards burning fat for fuel. When we burn fat for fuel instead of glycogen, we enter a state of ketosis, which is a state where, in the process of burning fat for fuel, ketones are released [Note: ketosis is different from ketoacidosis, and Dr. Peter Attia has a great article describing the difference]. There are two ways to enter ketosis: by fasting, or by eating a high-fat, low-carb ketogenic diet. This is why it is often said that ketogenic diets mimic fasting. Ketones are miracle molecules and have been shown to do all of the following: 1) suppress oncogenes, 2) decrease inflammation, 3) promote healthy cell metabolism & cell signaling, 4) promote healthy body weight and physiology, 5) improve good cholesterol and other cardiovascular markers, and 6) enhance cognitive ability. Ketosis is also thought to be the reason behind why ketogenic diets work so well for treating epilepsy and for reversing cancer tumors. Excellent research by Dr. Valter Longo has shown that by fasting we can drastically improve our immune system by 1) clearing away damaged white blood cells (via a process called autophagy) and 2) regenerating the immune cell population towards one that is more representative of our youth (by normalizing the ratio of myeloid cells to lymphoid cells). Fasting has also been shown to reduce inflammation via the reduction of the inflammatory cytokines TNF-alpha, IL-6, and IL-1. Fasting is known for triggering the expression of longevity genes, which are genes that are associated with a longer lifespan. Fasting also promotes healthy mitochondrial function. Healthy mitochondria are critical for preventing the oxidative damage that is associated with aging. Finally, fasting triggers the production of new stem cells as well as critical cellular repair processes. Fasting triggers weight loss via adipose thermogenesis (a.k.a. “calorie burning”) and promotes metabolic homeostasis. Our metabolism is boosted when we fast, as we alter our hormone profile to favor fat burning while preserving muscle mass. Fasting has also been shown to improve insulin sensitivity. When insulin sensitivity improves, our ability to store glucose and fat, as well as properly utilize glucose and fat for energy, improves. Research has shown that fasting can significantly reduce the risk of developing metabolic syndrome and cardiovascular disease. Additionally, fasting may also help prevent and reduce cancer via activation of tumor suppressor pathways, lowering of blood glucose and activation of AMPK, as well as by turning our immune cells into tumor killers. Research has also shown that, by promoting pancreatic beta-cell regeneration, fasting may help reverse diabetes. Finally, fasting may help prevent neurodegenerative disease and cognitive decline via the increase in production of brain-derived neurotrophic factor (BDNF) that is experienced during periods of calorie restriction. 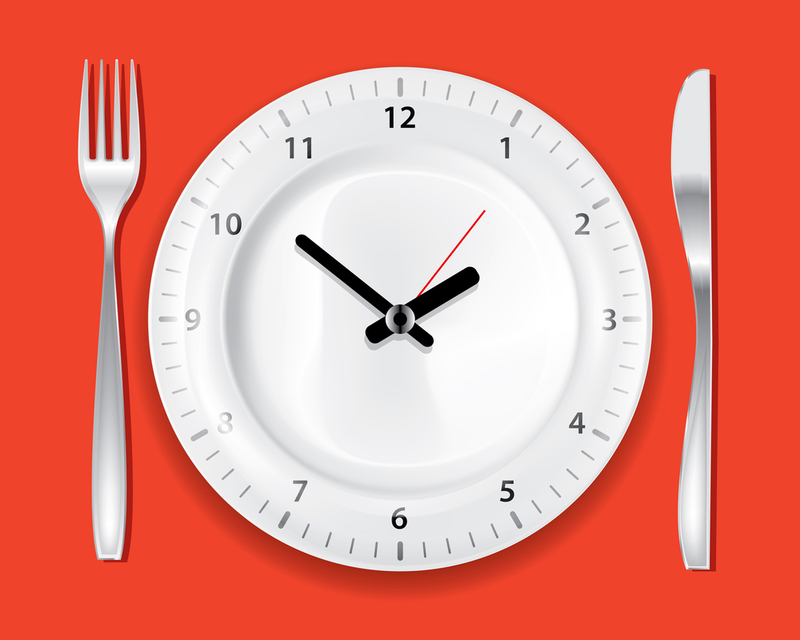 So what is intermittent fasting exactly? And how do you do it? Intermittent fasting (IF) is the safest form of fasting. It consists of voluntary fasting for short durations, typically 16-48 hours at most. We do not advocate long-term fasting (fasting for more than 48 hours), especially without a doctor’s consent. Long-term fasting is trickier to pull off, and arguably not as healthy as short-term fasting. Eat lunch at 12 pm. Eat dinner at 8 pm. Eat the next day at 12 pm. This is called the 16/8 regimen (16 hours fast, followed by an 8-hour eating window). The 16/8 is the most common IF protocol because it is the easiest to follow since you are sleeping for the majority of the 16 hour fast. However, there are a variety of other ways that you can structure your IF. If the 16/8 protocol is too hard for you, or if you are just starting out, trying simply skipping a meal now and then. It may be hard to do at first, especially if you are currently on a high-carb diet since you will experience more “sugar/carb” withdrawal (people on a high-carb diet typically have altered hunger and metabolism hormone function that keeps them in a state of “hunger”). But, it will get easier as you begin to stabilize your hormones; as we ease into IF, we start to improve our leptin signaling, which controls our appetite. Remember, the hunger cravings, if you have any, are temporary and will subside. During the fast, consume only water, black coffee, or tea. To help you prevent hunger during each fast, try eating a low-carb Paleo diet or Ketogenic diet during your allowed eating time. Is it safe? Is it for me? As we mentioned, short-term IF is safe for almost everyone (although you should always consult your doctor first), and there are a plethora of health benefits (as described above). The only side effects that may occur are headaches and constipation, which are usually temporary and are a by-product of your body going through high-carb withdrawal as well as hormone stabilization. We don’t recommend long-term fasts. We also DO NOT recommend that you try to fast if you are a child, are underweight, or if you are pregnant or breastfeeding. Furthermore, you should consult your doctor if you are taking medication, if you have diabetes, or if you have high uric acid. Still curious? Want to learn more about IF? Go VIP (it’s free!) and receive exclusive content from the HealthSnap team about IF, nutrition, and health & fitness in general.